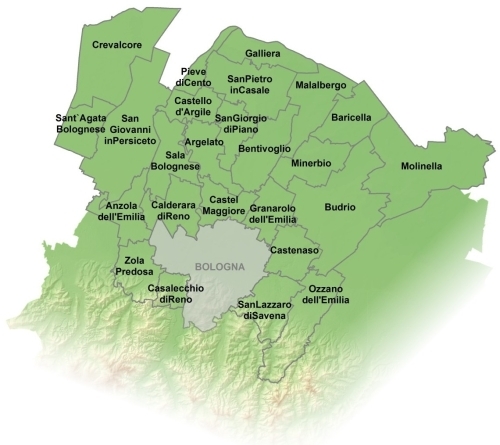 Pianura Bolognese is a part of the province of Bologna. Horseshoe-shaped around the city of Bologna, this territory extends northerly through the Padana Plain as far as bordering the provinces of Modena and Ferrara. In the south direction, the Pianura Bolognese tightens, reaching as far as the first Apennine reliefs, beyond the Roman Via Emilia. You can easily reach the Pianura Bolognese by car (A1, A13, A14 Motorways ), by train (Bologna-Vignola, Bologna-Verona, Bologna-Portomaggiore and Bologna-Rimini lines) or by plane, thanks to the nearby Bologna International Marconi Airport. Every location, including villages and hamlets, is very well served by public transport local buses. Being a mostly level area, it can be comfortably visited by bicycle as well. The Pianura Bolognese includes 25 Municipalities: Anzola dell’Emilia, Argelato, Baricella, Bentivoglio, Budrio, Calderara di Reno, Casalecchio di Reno, Castel Maggiore, Castenaso, Castello d’Argile, Crevalcore, Galliera, Granarolo dell’Emilia, Malalbergo, Minerbio, Molinella, Ozzano dell’Emilia, Pieve di Cento, Sala Bolognese, San Giorgio di Piano, San Giovanni in Persiceto, San Lazzaro di Savena, San Pietro in Casale, Sant’Agata Bolognese, Zola Predosa.